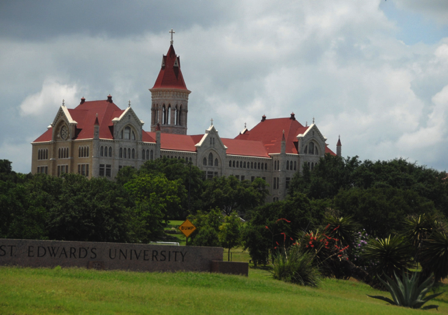 Exploring Austin with Kids News - Great day for a field trip to St. Edward's University! Tuesday, April 22nd, is Earth Day! 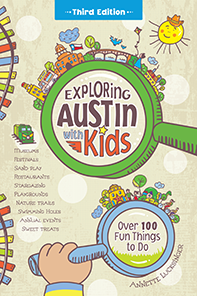 Exploring Austin with Kids will be celebrating with a book signing and children’s activities at the Earth Day Fair at St. Edward's University. Concoct tasty compost pudding, make an earth-friendly bird feeder, craft binoculars to get a better view of your world, and meet H.E.Buddy. If you’re in the neighborhood or looking for fun ways to teach the next generation to be good stewards, stop by from 11 am - 2 pm! * Tell them they’re about to visit a castle! My kids and I call the university “The Castle School” because of the gorgeous castle-like buildings on campus. You’ll walk right by the iconic Main Building as you head over to the Earth Day Fair just behind it. * Visit one of Austin’s largest oak trees! Sorin Oak just outside Sorin Hall is estimated to be 250-300 years old and its size is sure to impress young ones. Benches surrounding it make it a good meeting spot or place to stop and have a snack. * Pack a picnic lunch and set up a blanket under the oaks in front of the Main Building with a view of the downtown skyline from atop the hill. One of my favorite views of Austin. * Take a secret trip to the grotto. This sacred outdoor space faces the grotto at Notre Dame, St. Ed’s sister school. Built into the hill with stone, it’s a beautiful spot on campus – and just plain neat. To find it, cross University Circle from the Main Building. Look for the staircase that leads down to the soccer field. The grotto will be on your left at the bottom of the steps. * Play and take pictures in the bluebonnets! They’re growing near the soccer field in front of the Main Building. * Bring your own cup to the Fair for free coffee from Jo’s Coffee. For a special treat, you can find cookies in the coffee shop and other yummy eats in the Dining Hall in the Ragsdale Center (the building nearest the Earth Day Fair). * Pack a stroller for young ones. The campus is not big, but it can be a bit of a hike from the parking garage. Free parking.